Do you need to stop a door from opening? This will do it! Do you need to stop your door from opening? 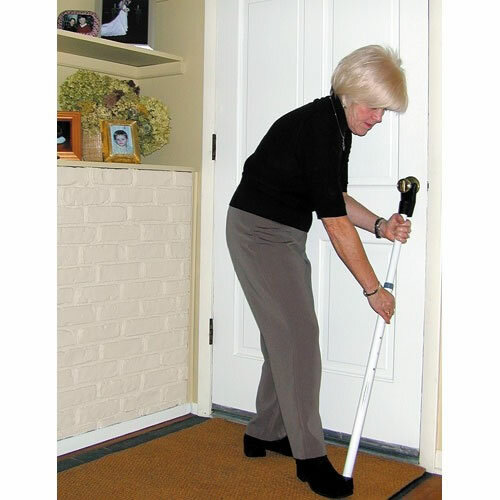 The dual function security bar is a strong 20 gauge steel adjustable door brace that installs easily under the doorknob and provides added security for your home, business or college dorm room. Adjustable from 24-46 inches. 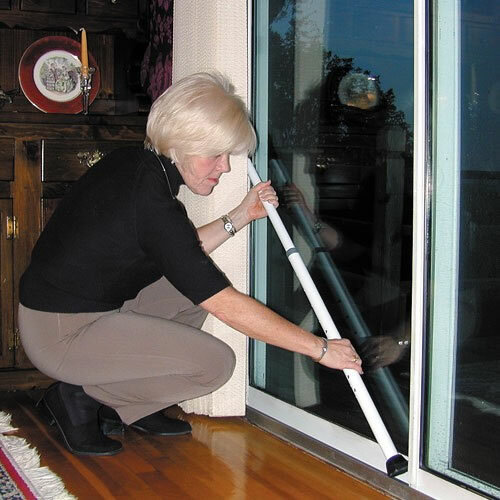 The steel bar adjusts to fit most hinged doors and one of the rubber end caps can be removed to allow for use on sliding glass patios as well. Clean, baked enamel finish makes this attractive for in-house use. This is the original Mace Brand safety bar with the sure stop rubber tip, it's not plastic. This device can be used to stop school doors from being opened. For Inward-Swinging Doors - Adjustable length will fit just about any door and prevent it from being opened. Every school should have one of these in their classrooms. This is also an effective locking mechanism you can use while traveling. With the device in place, you don't have to worry about someone coming into your room even if they have a key. As seen in The Following: The FBI agents used one of these in one of their safe houses to bar the door from being opened from the outside. Ever been to a motel and all of the sudden you hear someone trying to get in? The desk clerk assigns your room to someone else and gives them a key as well! They won't get in with the door jammer preventing it. Gives you time to call the front desk or the police if necessary. This is an extra layer of protection and security and is useful for just about any entryway. It can make you not only "feel" safer but actually "be" safer. It would take an awful lot to break in with one of these in place and in doing so would cause an awful lot of noise. You would have plenty of warning to call the police and arm yourself before they actually got in. 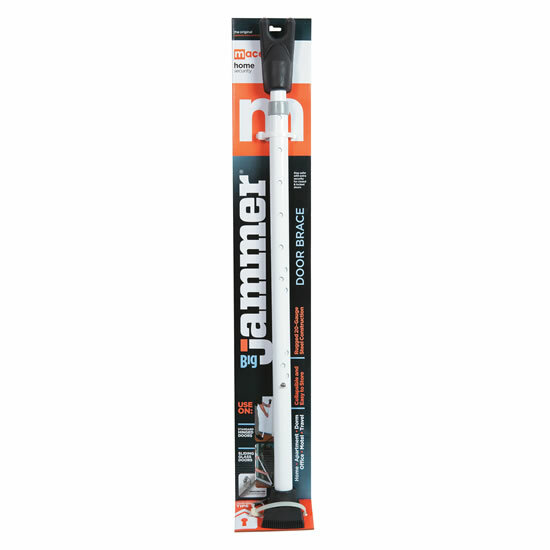 Mace Big Jammers provide added security against forced entry from intruders. The security brace is ideal for home, apartment, dorm, and office use. The Big Jammer is adjustable to fit most hinged in-swinging openings and installs easily by wedging under the knob to prevent forced opening. 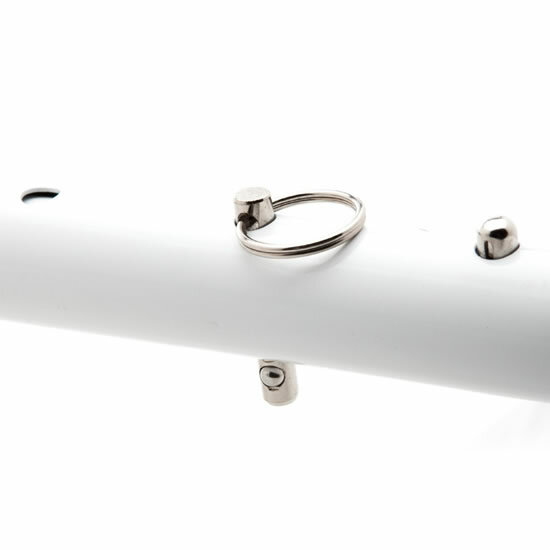 The rubber end caps can be removed and the brace quickly adapted for securing sliding glass openings. The Big Jammer is collapsible and easy to store, making it portable and a great choice for motel travelers. Stay safe with a Mace Big Jammer... Do-It-Yourself Home Protection!